Use the (favourite) button to start collecting favourites. Your basket is empty, do you need help finding something? contact us. Lleyn is a neat and compact tablet case, wrapping securely around your device to keep it safe from knocks, scratches and cold weather. 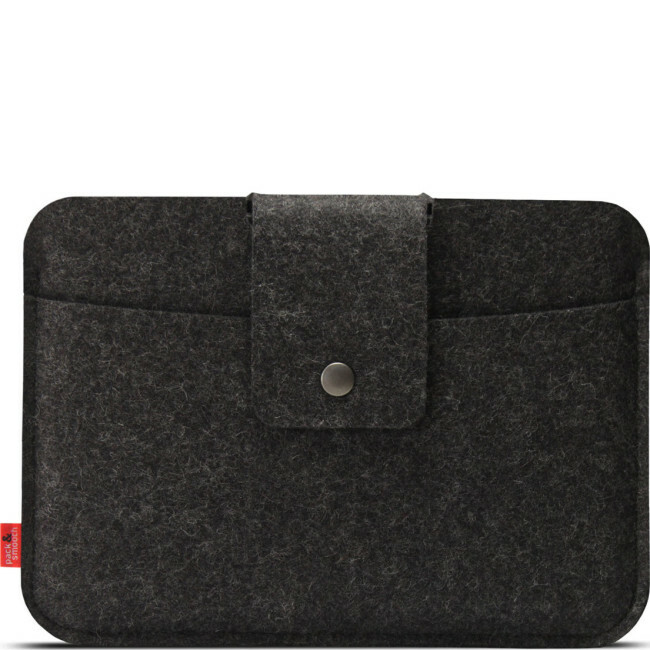 Constructed from plush wool felt, it’s a soft and handsome accessory for your tech. Custom made for the iPad Mini, with a front pocket for everyday basics, this tablet sleeve is perfectly sized to carry along with your notebooks, or stow away into a larger bag. 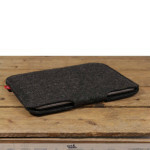 This shock-absorbent woollen sleeve will protect an iPad Mini 3 or 4, with space to accommodate a Smart Case or Cover. 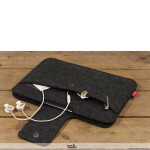 Slot your pen, headphones, USB cable and business cards into the front slip pouch, easily accessible when you need them. Hold your iPad firmly in place with the top strap, featuring a snap fastener for zip-free entry to your case. Lleyn is a slim, petite tablet case, made with the iPad Mini 3 and 4 in mind. Crafted entirely from thick Merino wool felt, this luxury cover offers peace of mind that your tech is protected by the very best materials. Store your tablet with or without a smart case; the anti-static, water-resistant sleeve will safeguard your iPad from the elements. An exposed front pocket leaves space for small accessories, preventing scratches on the device. Raw wool and the nickel-free PRYM snap fastener make this an environmentally-friendly case for eco-conscious tech owners. With a plush look and feel and handmade design, it’s an enduring addition to your kit. The pure wool design of this tablet sleeve means it’s not only soft and attractive; it’s also water-repellent, static-resistant and completely recyclable. To care for your case, gently wipe away excess dirt with a damp cloth. Artisanship is a defining element of the Pack & Smooch range. 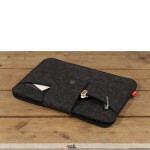 Made in Germany, their premium laptop and tablet cases use only the finest materials. Ethical and eminently practical, these accessories are custom made to suit the latest Apple and Samsung devices. Did you know we add new products all the time?